In the last two decades, there has been almost a 90% decline in the vulture populations of the sub continent. Several species that were once abundant such as the Gyps vultures are now nearing extinction. The culprit for this has been identified as Diclofenac Sodium, an anti-inflammatory drug that is used to treat ailments in cattle. When vultures consume carcasses of cattle treated with diclofenac, it causes poisoning, gout, kidney failure and death. Meloxicam has been made available as an alternative after the banning of diclofenac, but since the drug is expensive, diclofenac is still being used illegally. 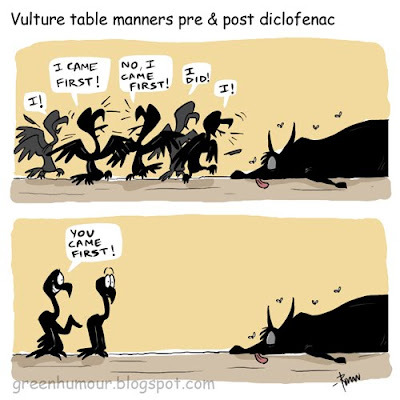 Here's another one on the Diclofenac debacle. Being a cartoonist myself, I must say that I really like your work. Your humour and punchlines are excellent, and your attack on issues is direct and in excellent taste. Keep up the great work! Hi! I'm an undergraduate student from Sweden and have been writing a paper about the vulture decline. I happened to come across your page and really love your cartoons! Keep up the good work!